Staying warm and dry during stormy and wintry weather is a top concern. So something as simple as a stomach full of warm, healthy food can go a long way. Fortunately for a number of people making their own shelter near Galletti Way by the Truckee river, warm faces, as is the custom most Monday nights, are arriving with even warmer food. Food Not Bombs is an activist group made up of independent collectives that organizes pop-up soup kitchens or “potlucks” around the country. Nationally it began in the 1980s and since then has created chapters all over the world. According to local chapter member Griffin Peralta, this Reno chapter of Food Not Bombs has been in existence for around seven years and began in conjunction with the brief Occupy Reno movement in 2011. It is now made up of several dozen members. “Occasionally the police department will come down here and bust up a bunch of living situations. We’ll have to scramble around and find new concentrations of people,” Peralta said. There may be times when the authorities force people to leave the small square of earth that they call home, but on this Monday when reporters from Our Town Reno came to take photos and interview those helping and those being helped, the group is at their customary spot, on the corner of Galletti Way and Glendale Ave. 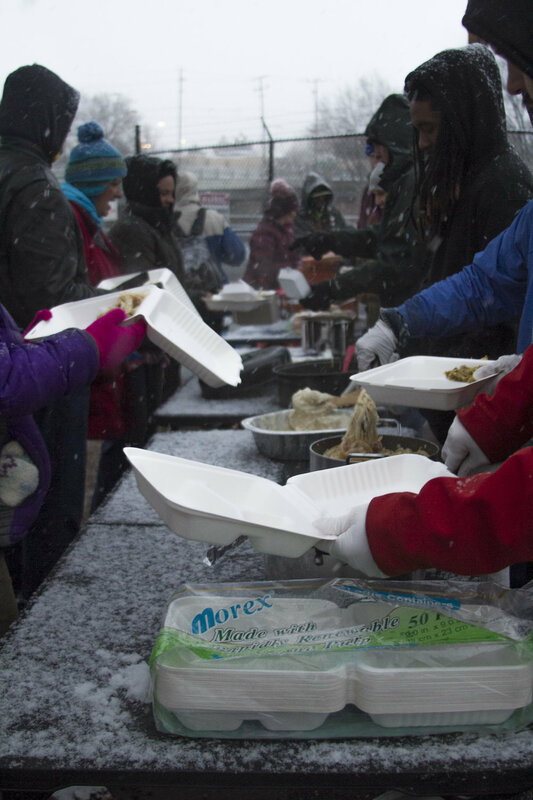 They serve warm food that they brought themselves, to a long line of cold and grateful people. Peralta who has been with Food Not Bombs for about three years says his chapter began in conjunction with the brief Occupy Reno movement in 2011 and is now made up of around 30-45 members or recruits. 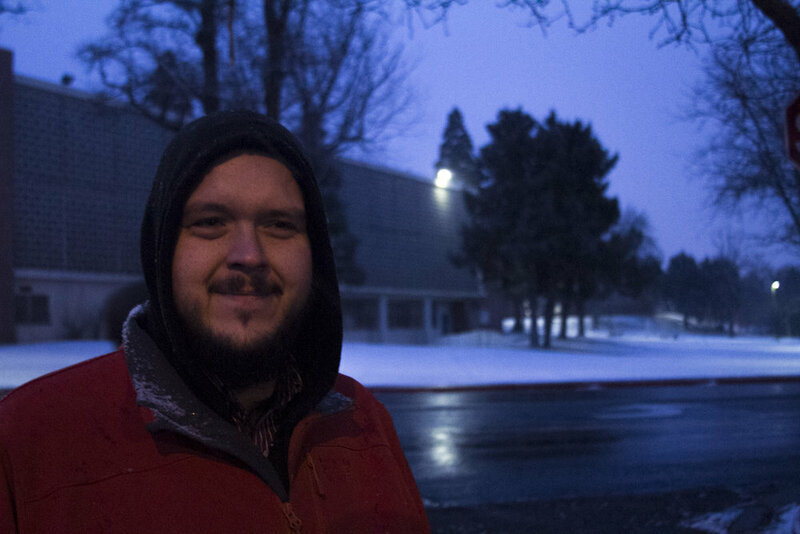 Photo and Reporting by Jordan Gearey for Our Town Reno. The chapter members come equipped with crock pots and soup ladles. They try and serve primarily vegan and vegetarian dishes but meat is always accepted when provided. They’re all dressed in caps and coats. Some of them give off smells of cannabis and Backwood Cigars. This isn’t your ordinary church crew or charity organization. 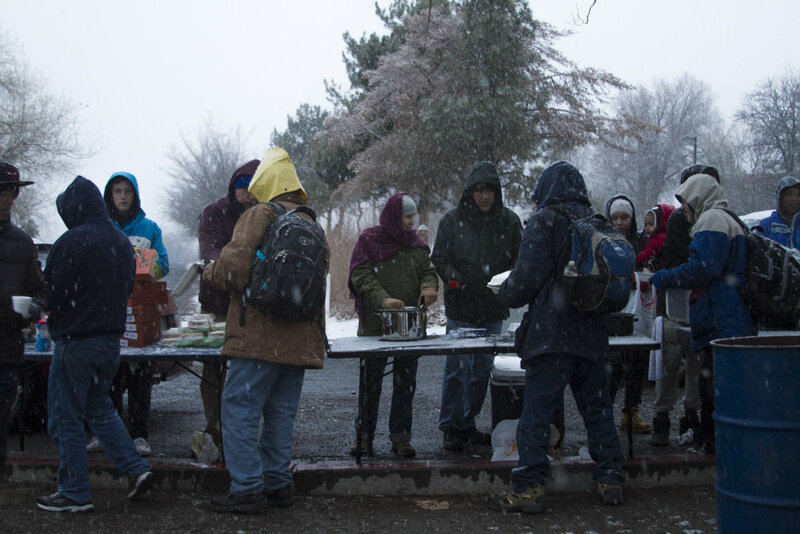 This is Food Not Bombs, a group of self-identifying anarchists who flash smiles beneath snow-covered hoods, as they feed some of Reno’s houseless. For over an hour people in need wrapped in coats shuffle through the line to fill their stomachs before they retreat beneath a nearby bridge to try and sleep through the cold night. Photo and Reporting by Jordan Gearey for Our Town Reno. “It’s direct action, and in this crazy world it’s easy to feel hopeless. It’s just helping people out in a small way and it gives us an opportunity to show people that we care,” said Reena Spansail, a more recent member of Food Not Bombs Reno. Spansail works as an English teacher at Wooster High School. She says she tries to teach her students to incorporate kindness and inclusion into their lives. “The hardest part was the wind last night. It seemed like it would never stop,” a man who wished not to give his name said of sleeping outside. He has with him a beautiful female German Shepherd named Clyde. Clyde is in luck. Food Not Bombs does not discriminate against furry companions. Dog food is also provided. Many houseless with pets avoid shelters because their companions are not accepted there. Photo by Jordan Gearey for Our Town Reno. Once the majority of the food is gone, the people begin to shuffle back down to the darkness beneath the bridge. The late night Glendale Avenue traffic runs over their heads, and the frigid Truckee River waters threatens nearby. The Food Not Bombs members pack up. “I hope that people say that I cared and listened, and as far as the organization, I hope that people just say yum. I hope they are satisfied, I hope they’ve got food in their bellies, and I hope they’re warm with a smile on their face,” Spansail said.